Missouri State Representative Diane Franklin (R) has proposed a bill that will create a 1 percent tax on all video games sold with a rating of Teen, Mature or Adult from the ESRB. The money raised from the tax will go to support mental health programs. This news comes from the folks at GamePolitics.com, and they point out that Franklin made no attempt in her proposal to levy this tax against any other potentially violent form of entertainment. The tax applies specifically to games, so movies, music, television, books and comics will continue as they are, un-taxed. That's right, you'll need to give extra money to the government for purchasing a T-rated video game, but you'll be fine viewing an NC-17 rated film, watching a TV-MA show and listening to music with explicit lyrics. Because, you know, video games ruin everything. All of this comes, by the way, besides the fact that City, State and Federal government can't tax things protected by the first amendment. Here's one legal document that cites several cases where this has been hit on by court authorities. Aside from the absurd notion that violent games should be taxed, while R-rated movies and explicit music go unnoticed, there's another facet to Franklin's proposal that's perhaps more mind-boggling. By imposing a tax on games rated "Teen" and up, Franklin's bill would tax titles that have practically no gun violence whatsoever. Any game with a suggestive theme falls under that label. Dance Central? Taxed. The Sims 3? Taxed. Okami HD? Taxed. No matter how you slice it, this idea of taxing a specific rating tier of games is absurd. Games aren't all shoot 'em ups and military simulators, and the scary part of this whole thing is that an actual representative of the people in a community has a misinformed opinion about them. We've been avoiding this whole violence in games thing here at TechnoBuffalo. Our writers love all genres of gaming, and we don't want to get caught up in the banter of shooters supposedly damaging culture. We don't think they are responsible for what's going on in the world. However, this taxation of a piece of free speech is completely ridiculous on so many levels that we had to put our thoughts down for you. Where do you stand on taxing games based on their ratings? 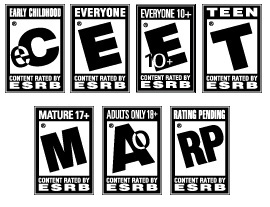 Personally, I suggest gamers abide by the ratings given out by rating boards in countries around the world. If a game is rated for the 17-and-up crowd, don't let your 12 year old son or daughter play it.